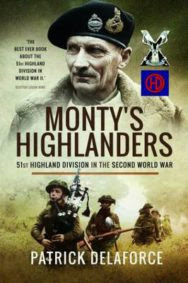 The 51st Highland Division was the most famous infantry division that fought with the British Army in WW2. It was the only infantry division in the armies of the British Empire that accompanied Monty from during Alamein to Berlin. After the 1940 disaster at St Valery when many were killed or captured, the re-formed 51st were a superlative division, brilliantly inspired and led. The 'Highway Decorators' (after their famous HD cypher) fought with consummate success through North Africa and Tunisia and from Normandy into the heart of Germany. Blooded at Alamein - where they suffered over 2000 casualties - they pursued the Afrika Korps via Tripoli and Tunis fighting fierce battles along the way. They lost 1,500 men helping to liberate Sicily. Back to the UK for the second front, the Highlanders battled their way through Normandy bocage, the break-out to the Seine, triumphal re-occupation of St Valery, and were the first troops to cross the Rhine, fighting on to Bremen and Bremerhaven. In the eleven months fighting in NW Europe in 1944 and 1945 the Highlanders suffered more than 9000 casualties.